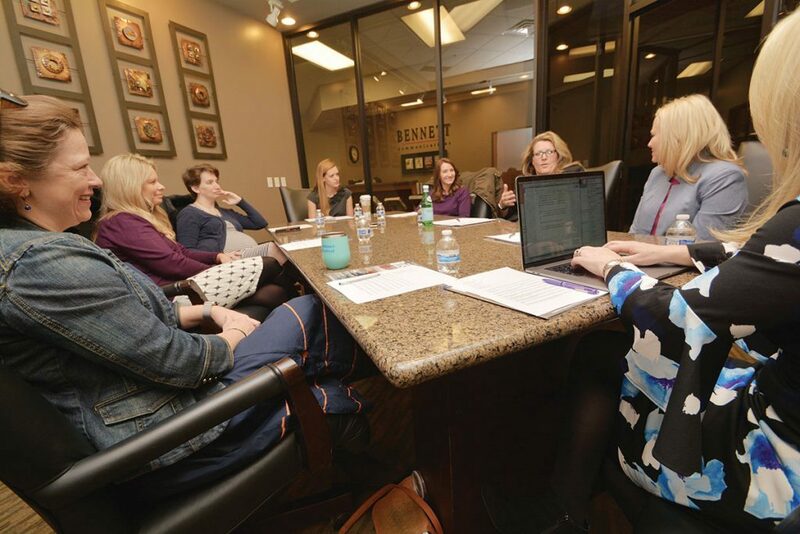 For our Spring 2018 issue of Utah Valley BusinessQ, we invited the women to sit at the table — more specifically, we invited women in tech. These local tech pros have cracked the code on how to work in a male-dominated industry. Bennett, BusinessQ: What advice do you give to women in tech? Birch, MTEC: I talk to so many girls who think they will be a mom and they don’t need to get an education and work. I’m not saying being a stay-at-home mom is a bad thing. But I tell them that the climate right now is for technology. We don’t have many girls in our programs, and when we do, they are asked to work before they are done. Even if they are not the best in the class, they bring a different mindset to technology — and companies know that. As a woman, you’ll have more opportunities, you’ll work less hours and you’ll get more out of life if you educate yourself well. Do what you love, do it well, and you will have a really good life. Morningstar, Qualtrics: I try to tell everyone how great my life is, because they aren’t hearing those messages. When they look on TV and they see those harried moms who are trying to do it all and are failing at everything, that is the social message. But that’s not my experience. I have an amazing life. Martin, BambooHR: Girls live with these stereotypes. They think if they are going to do computer science, they are going to be a little nerd at the computer. They don’t understand how many careers and opportunities there are in the world. Cydni Tetro wears two hats: co-founder of the Women Tech Council and CEO of Forge DX, a software company that does digital transformation integration between IM and mobile. When she’s not inspiring and mentoring girls of all ages, Tetro has spent her career working with world-class brands like Disney and Marvel. Birch, MTEC: It’s OK for me to show my sons that it’s OK to be strong. I hope they find strong women in their lives, too. My husband has always supported me. There was a time when I supported him and raised kids, and then I went back to work and he supported me. Children and young adults don’t see that message when the women in their lives aren’t being supported. I tell my boys all the time that when they get married, they can’t assume their wife is going to stay at home. If she wants to work, or if she wants to stay at home, support her. Tucker, Polis: I hate going into things with my eyes closed. So before I started my company, I made 110 expert calls. I reached out to women so far removed from myself that I’d be emailing Carine on LinkedIn like, “Hey, we are third connections on LinkedIn. Can we chat?” People want to help when you ask. So when I mentor women, I go far out of my way to give them tools. We all need role models, and they are not all going to be women. The majority will be men. Clark, Banyan: I try and get young women to visit their future. A lot of young women tell me they want to be a hairdresser. So I tell them to go spend the next four weekends in a hair salon. You can’t sit down, you’ve got to stand and sweep the hair. They can only get through two weekends. Birch, MTEC: Plus you’re not making money every hour you’re in there. Clark, Banyan: I run into a lot of parents who don’t help their kids plan their lives. I have helped my kids visit their futures. If they say they want to be a garbage man, we follow the garbage truck all day. Then my kids would say, “They don’t ever get to play with the garbage.” And I would say, “Nope they don’t.” Suddenly they didn’t want to be a garbage man anymore. Birch, MTEC: When I grew up, I wasn’t allowed to take woodshop. I had to take home ec, and I hated it. I remember my dad telling me he would pay for me to go to school to become a secretary, and then followed by, “You need to go out and find a husband.” I made sure I went the rest of the way with my education. I hope girls aren’t getting those messages today. Girls can do anything.